The owners of a pack of scarred fighting dogs were caged for six months this week. Ricardo Byfield, 27, and Lisa Harvey, 34, illegally bred pit bull terriers to use in organised dog fights. The animals were found locked in cages around the Northolt pair’s one-bedroomed council home, which doubled as a dog-training gym. Police raided the house in Whitton Avenue West last year to rescue 26 dogs, mostly pit bulls but three Dogues de Bordeaux, a rottweiler and a Staffordshire bull terrier were also found. The dogs were found covered in scars from vicious dog-fights and some were marked on documents as “Champion” or “Grand Champion” – meaning they had won several fights. Puppies aged between two weeks and four months old were also rescued in the August raid. A homemade treadmill which officers believe was used to exercise the dogs was also recovered. At the pair’s sentencing in Ealing Magistrates’ Court on Thursday afternoon a judge ordered 21 of the dogs, who were previously in police care, to be destroyed. 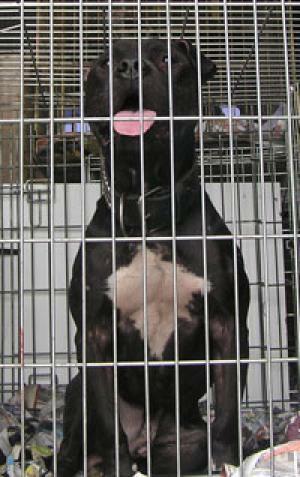 Owners of pit bulls and other dangerous dogs must have a certificate to allow them to keep the animals. The dogs must also be neutered and microchipped. Byfield admitted 19 counts of possession and breeding of dangerous dogs and Harvey admitted one charge of possession and breeding of dangerous dogs. Byfield was sentenced for six months and ordered to pay £500 costs. Harvey was also jailed for six months and must pay £250 costs. They were both banned from owning dogs for the rest of their lives. A 21-year-old man from Wembley was also arrested under the Dangerous Dogs Act but was not prosecuted because there was no evidence to link him to the offence. Chris Laurence, veterinary director of the Dogs Trust, has condemned the practice of breeding fighting dogs as “cruel”. He said: “Dogs Trust condemns the breeding of dogs for fighting and supports measures to bring the full force of the law against the breeders of such dogs. “We outlaw all aspects of this cruel practice, whether it is the organising of the fights, breeding dogs for fighting, or even attending fights.